Trichomes, those little tiny crystal-like hairs that cover the buds, hold all the good stuff. The different methods of hashmaking focus on isolating these sticky little parts of the cannabis plant because they house the majority of its resin. Every part of the cannabis plant has at least a little THC in it. Leaves have around 4%, while buds have up to 25% or 30% of dry weight. 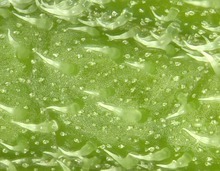 The trichomes cover all parts of the buds, from the interior stems to the surrounding leaves. Scientists used to think that THC and other cannabinoids were made in the green plant tissue and transported out to the trichomes during flowering, but after intensive research, they realized that the trichomes themselves make the cannabinoids and terpenes. 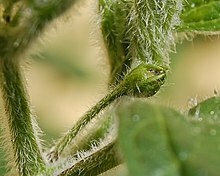 Trichomes might grow off a leaf around the flower of a female plant, or a bract (pictured above). A bract houses the seeds in a fertilized plant, and has a high density of trichomes. Looking closely, you’ll see six different types of these glands are all oozing resin during flowering, but the biggest ones with the most juice are the capitate stalked trichomes. At about 50 to 100 micrometers wide, trichomes are very small. Zoom in close enough and you can see the individual cells that make up the structure. Capitate stalked trichomes have two main parts: the stalk and the gland head. The epidermal cells hold up the mature trichome forming the outside of the stalk, and a continuous layer extends over the entire bract surface. The hypodermal cells on the inside of the stalk constantly transport nutrients (http://en.wikipedia.org/wiki/Phloem) to the gland head. The basal cell at the top of the stalk holds on to the gland head. As the flower matures, and as mature flowers dry, this connection weakens and gland heads tend to fall off. At the base of the gland head are stipe cells, which hold up the secretory cells. Secretory cells take the nutrients from the phloem and turn them into precursors for cannabinoid and terpenoid metabolism. The theory is that these precursors get transported to the secretory vesicles above, and are converted into cannabinoids and terpenoids once they’re there. As the gland head churns out its product, the resin gets deposited, and up close to the cuticle, the outer layers of trichome surface. The cuticle, thickens getting richer and richer in oil as flowering progresses. The essential oils, including THC, mostly accumulate on the outer layer of the gland head, but also on the outer layer of the epidermal cells that cover the entire bract, or any trichome-dense area. Resinous THC also accumulates in the fibrillar matrices (pardon the jargon) of the secretory vesicles. Inside these vesicles there is some THC, but also high amounts of terpenoids, which are less viscous. The presence of THC mostly on the outside of the plant is great news, but no surprise; extractions on unadulterated bud work spectacularly well because of this fact. While grinding up flowers makes them easier to work with for cooking or small-scale extractions, it’s not necessary for getting a high yield. *This article has been modified from it's original source. (Originally printed in High Times Magazine) By Sirius J March 27, 2015 http://hightimes.com/grow/the-anatomy-of-a-trichom..
Trichomes (/ˈtraɪkoʊmz/ or /ˈtrɪkoʊmz/), from the Greek τρίχωμα (trikhōma) meaning "hair", are fine outgrowths or appendages on plants, algae, lichens, and certain protists. They are of diverse structure and function. Examples are hairs, glandular hairs, scales, and papillae. A covering of any kind of hair on a plant is an indumentum, and the surface bearing them is said to be pubescent. Certain, usually filamentous, algae have the terminal cell produced into an elongate hair-like structure called a trichome. The same term is applied to such structures in some cyanobacteria, such as Spirulina and Oscillatoria. Cyanobacteria trichomes may be unsheathed, as in Oscillatoria, or sheathed, as in Calothrix. These structures play an important role in preventing soil erosion, particularly in cold desert climates. The filamentous sheaths form a persistent sticky network that helps maintain soil structure. 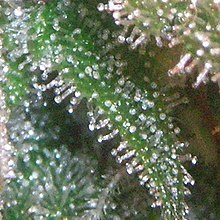 Trichomes on plants are epidermal outgrowths of various kinds. The terms emergences or prickles refer to outgrowths that involve more than the epidermis. This distinction is not always easily applied (see Wait-a-minute tree). Also, there are nontrichomatous epidermal cells that protrude from the surface. 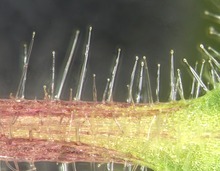 Hairs on plants are extremely variable in their presence across species and even within a species, such as their location on plant organs, size, density, and therefore functionality. However, several basic functions or advantages of having surface hairs can be listed. It is likely that in many cases, hairs interfere with the feeding of at least some small herbivores, and, depending upon stiffness and irritability to the palate, large herbivores as well. Hairs on plants growing in areas subject to frost keep the frost away from the living surface cells. In windy locations, hairs break up the flow of air across the plant surface, reducing transpiration. Dense coatings of hairs reflect sunlight, protecting the more delicate tissues underneath in hot, dry, open habitats. In addition, in locations where much of the available moisture comes from fog drip, hairs appear to enhance this process. Root hairs, the rhizoids of many vascular plants, are tubular outgrowths of trichoblasts, the hair-forming cells on the epidermis of a plant root. That is, root hairs are lateral extensions of a single cell and only rarely branched. Just prior to the root hair development, there is a point of elevated phosphorylase activity. [clarification needed] Root hairs vary between 5 and 17 micrometres in diameter, and 80 to 1,500 micrometres in length (Dittmar, cited in Esau, 1965). Root hairs can survive for two to three weeks and then die off. At the same time new root hairs are continually being formed at the top of the root. This way, the root hair coverage stays the same. It is therefore understandable that repotting must be done with care, because the root hairs are being pulled off for the most part. This is why planting out may cause plants to wilt. Plants may use trichomes in order to deter herbivore attack via physical and/or chemical means, e.g. in specialized, stinging hairs of Urtica (Nettle) species that deliver inflammatory chemicals such as histamine. However, some organisms have developed mechanisms to resist the effects of trichomes. The larvae of Heliconius charithonia, for example, are able to physically free themselves from trichomes, are able to bite off trichomes, and are able to form silk blankets in order to navigate the leaves better. ^ Bhatia, R.Y.P. ; Raghavan, S.; Rao, K.V.S. ; Prasad, V.N. (1973). "Forensic examination of leaf and leaf fragments in fresh and dried conditions.". Journal of the Forensic Science Society. 13 (3): 183–190. doi:10.1016/S0015-7368(73)70794-5. ^ Szyndler, M.W. ; Haynes, K.F. ; Potter, M.F. ; Corn, R.M. ; Loudon, C. (2013). "Entrapment of bed bugs by leaf trichomes inspires microfabrication of biomimetic surfaces" (PDF). Journal of The Royal Society Interface. 10 (83). doi:10.1098/rsif.2013.0174. ISSN 1742-5662. ^ Cardoso, Márcio Z. "Ecology, Behavior and Binomics: Herbivore Handling of a Plant's Trichome: The Case of Heliconius Charithonia (L.) (Lepidoptera:Nymphalidae) and Passiflora Lobata (Kilip) Hutch. (Passifloraceae)." Neotropical Entomology 37.3 (2008): 247-52. Web.